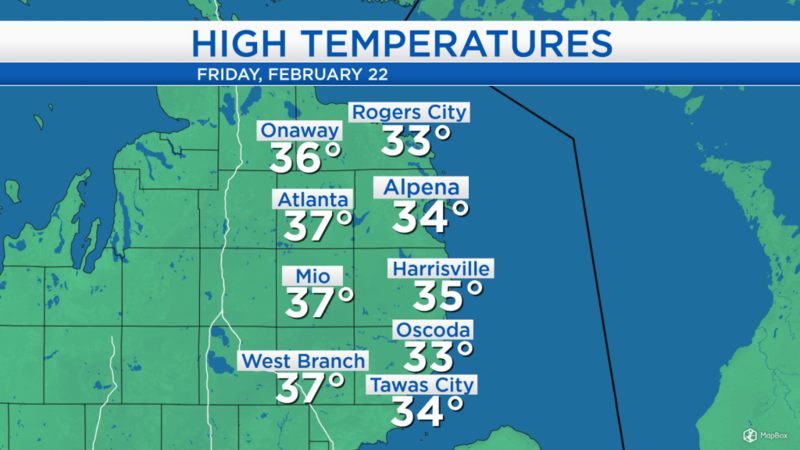 High temperatures today reached the middle/upper 30s around Northeast Michigan. Skies began cloudy this morning, then became mostly clear in the afternoon. The dry weather will continue tonight through tomorrow morning, until a storm system traveling through the Southern Plains moves into the Great Lakes. The storm system affecting our area this weekend is currently positioned near the Colorado-New Mexico border. Tomorrow, the storm system will move through Kansas, Missouri and Iowa on the way to Northern Michigan. Ahead of this storm system, moist and warm air out of the south will bring a wintry mix changing to rain late Saturday. It will cross through Northern Michigan early Sunday, after which winds will strengthen out of the west causing temperatures to sharply drop. A Winter Storm Watch has been issued by the National Weather Service for all of Northern Michigan, beginning Saturday afternoon. 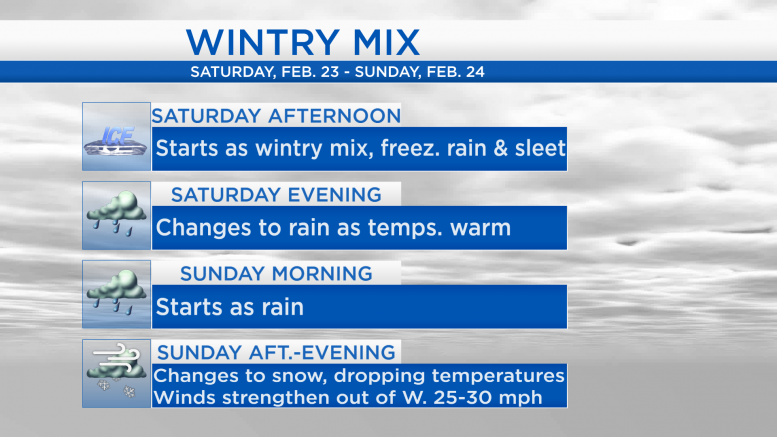 This Winter Storm Watch covers the multiple types of precipitation we will see this weekend and strong winds developing Sunday midday/afternoon. Low temperatures tonight will drop to the upper teens or close to 20 degrees overnight under partly cloudy skies. Tomorrow will likely start with dry weather in the morning and temperatures in the mid-20s. A wintry mix including some sleet and freezing rain will arrive during the afternoon, changing to rain tomorrow evening as temperatures climb above the freezing mark. A wintry mix will begin tomorrow afternoon, causing slippery roadways especially where they are left untreated. Temperatures will likely continue to warm after sunset, leading to rain throughout the nighttime hours and Sunday morning. This storm system will likely end with some snow Sunday afternoon and evening with amounts around 1-3 inches. While the snowfall accumulations will be unimpressive, any snow combined with strong winds will result in blowing snow late Sunday. 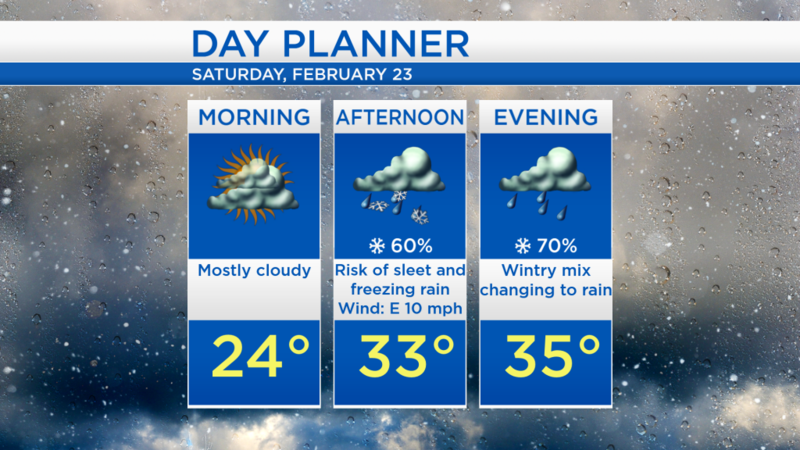 While tomorrow will start dry, it will end with a messy wintry mix. Rain to start on Sunday will change to snow in the afternoon as colder air rushes in combined with strong winds. Much colder temperatures are expected early next week. For the rest of Northeast Michigan’s weather forecast, watch the latest weather video by clicking the weather tab at the top of the page.